When NASA's Curiosity Mars rover landed in 2012, it brought along eclipse glasses. The solar filters on its Mast Camera (Mastcam) allow it to stare directly at the Sun. Over the past few weeks, Curiosity has been putting them to good use by sending back some spectacular imagery of solar eclipses caused by Phobos and Deimos, Mars' two moons. Phobos, which is about 7 miles (11.5 kilometers) across, was imaged on March 26, 2019 (the 2,359th sol, or Martian day, of Curiosity's mission); Deimos, which is about 1.5 miles (2.3 kilometers) across, was photographed on March 17, 2019 (Sol 2350). Phobos doesn't completely cover the Sun, so it would be considered an annular eclipse. Because Deimos is so small compared to the disk of the Sun, scientists would say it's transiting the Sun. In addition to capturing each moon crossing in front of the Sun, one of Curiosity's Navigation Cameras (Navcams) observed the shadow of Phobos on March 25, 2019 (Sol 2358). As the moon's shadow passed over the rover during sunset, it momentarily darkened the light. Solar eclipses have been seen many times by Curiosity and other rovers in the past. Besides being cool -- who doesn't love an eclipse? -- these events also serve a scientific purpose, helping researchers fine-tune their understanding of each moon's orbit around Mars. Before the Spirit and Opportunity rovers landed in 2004, there was much higher uncertainty in the orbit of each moon, said Mark Lemmon of Texas A&M University, College Station, a co-investigator with Curiosity's Mastcam. The first time one of the rovers tried to image Deimos eclipsing the Sun, they found the moon was 25 miles (40 kilometers) away from where they expected. "More observations over time help pin down the details of each orbit," Lemmon said. "Those orbits change all the time in response to the gravitational pull of Mars, Jupiter or even each Martian moon pulling on the other." These events also help make Mars relatable, Lemmon said: "Eclipses, sunrises and sunsets and weather phenomena all make Mars real to people, as a world both like and unlike what they see outside, not just a subject in a book." 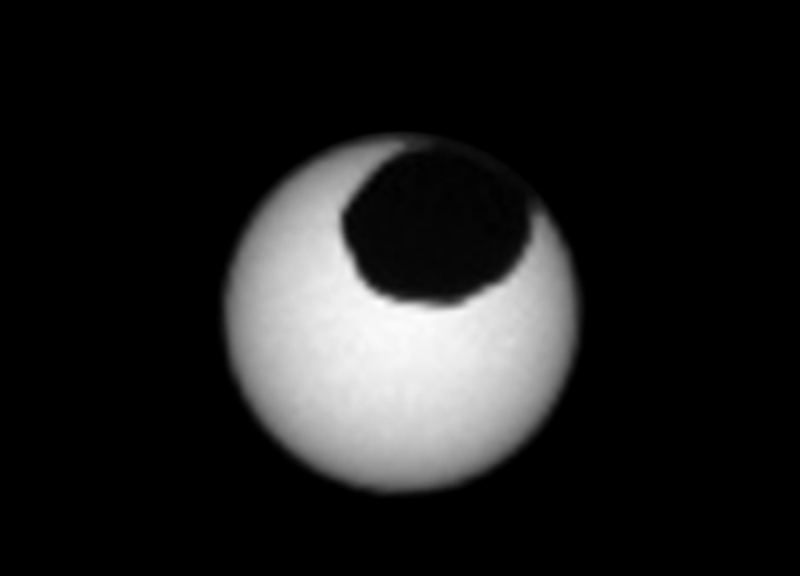 To date, there have been eight observations of Deimos eclipsing the Sun from either Spirit, Opportunity or Curiosity; there have been about 40 observations of Phobos. There's still a margin of uncertainty in the orbits of both Martian moons, but that shrinks with every eclipse that's viewed from the Red Planet's surface. NASA's Jet Propulsion Laboratory, a division of Caltech, manages the Mars Science Laboratory Project for NASA's Science Mission Directorate, Washington. JPL designed and built the project's Curiosity rover. Malin Space Science Systems, San Diego, built and operates the Mastcam instrument and two other instruments on Curiosity.